Things appear to be getting bleaker and bleaker and the end might be near for drummer Bobby Blotzer‘s version of Ratt. Singer Josh Alan who fronted Blotzer‘s version of Ratt for more than a year and previously Bobby Blotzer’s Ratt Experience for a few months has revealed that he resigned from Blotzer‘s Ratt back on January 23, 2017. Blotzer apparently chose not to make this information public. The date of January 23, 2017 coincides with when Blotzer brought a motion for reconsideration via his company WBS, Inc. (of which guitarist Warren DeMartini apparently owns 50%) against Juan Croucier and with respect to a motion decision on November 8, 2016 in Croucier‘s favour. On February 4, 2017, it was announced that Blotzer‘s motion for reconsideration was denied by a court. 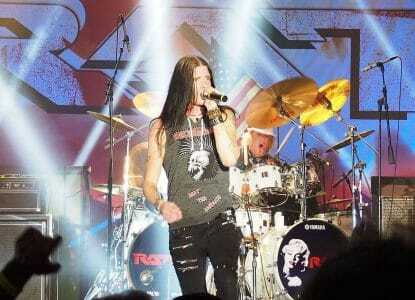 Blotzer has released a few cryptic messages via the Facebook page for his version of Ratt since that time. “Good morning, beautiful people! I just want to take a second to bring you all an update. As some of you may already know, I have resigned from my position with Bobby Blotzer/Ratt as of January 23rd. I thank you all from the bottom of my heart for all of your love and support along the way! I would not have made it through this without you! I will be working and focusing on my original music this year. If you would like to catch me live, I will be doing solo acoustic shows throughout the year as well (what I enjoy most), just check in here for updates! With that being said, I have had an absolute wonderful time on this tour. I have met a lot of very good people and gained experience that I would not have otherwise. For that, I am forever grateful.